The study of altered protein expression patterns in diseased myocardium has greatly contributed to our understanding of cardiac dysfunction. Adenovirus-mediated changes in this protein expression pattern in order to correct deregulated protein synthesis is currently undergoing widespread interest and is emerging as a possible future therapy. In an in vitro setting, most experiments to date have used primary adult myocyte cultures to study the impact of adenovirus-mediated gene transfer on the function of the myocardium. Several studies have already indicated that the isotonic shortening behavior of isolated myocytes can be successfully changed through adenoviralmediated gene transfer. However, under cell culture conditions active loaded contractions do not occur as they do in situ,thereby hampering interpretation to this in vivo situation. Although multicellular cardiac preparations may not represent every single aspect of the beating heart, loading conditions can be influenced and these preparations have a multicellular architecture contracting under loaded conditions as occur in heart. The latter implies that impact of secretory factors and interaction between different cell types is possible. Moreover, cell-to-cell connections allow for passing-on of intracellular signals and physical loading conditions, between myocytes specifically, in these multicellular preparations. 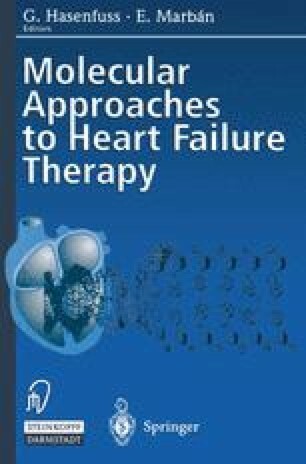 We have used a Langendorff-based adenoviral gene-transfer protocol to the rabbit heart and cultured multicellular preparations from these hearts for several days. Basic contractility parameters did not change over time when such preparations were cultured, and physiological and pharmacological responses were well preserved. Although after 48 hours efficient and high levels of the transfected reporter-gene LacZ were observed in the individual myocytes of the preparation, contractile parameters and physiological/pharmacological responses were unaltered.